The 1825 Maverick Plan of the Academical Village is often believed to be an accurate representation of the Lawn, when in reality the Lawn was much more crowded. By the time Pavilion VI was finished in 1824, there was limited space dedicated to utilitarian purposes. Since both the pavilions and hotels were crowded, it was necessary to build for such purposes in the adjacent gardens. Thomas Jefferson acknowledged the necessity of outbuildings in a letter to Proctor Brockenbrough, stating, “…a smoke house is indispensable to a Virginia family.” Beginning in the 1830s, the Board of Visitors approved the building of what was then called an "office" (in this case, a kitchen) and acknowledged that there was already a smokehouse in the garden of Pavilion VI. There is evidence from engravings, maps, photographs, and archaeological excavations that at least five outbuildings had been built in the Garden of Pavilion VI / Hotel D (not necessarily existing concurrently). The digital reconstruction of this garden is based on the evidence from University-related documents and research into similar structures. 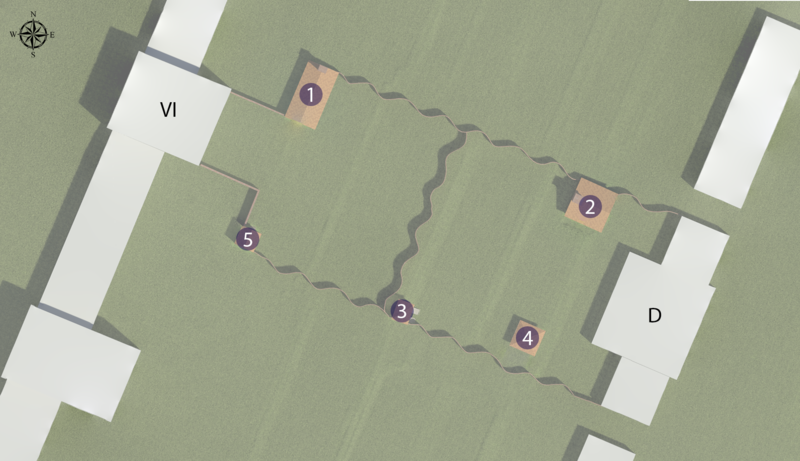 Below is a map of Garden VI with all of the outbuildings labeled. Structure 1 was a kitchen and laundry serving Pavilion VI. Structure 2 was a kitchen, laundry, and slave living quarter serving Hotel D. Structure 3 is believed to have been a privy and has been modeled as such. Structure 4 could have been a dairy or smokehouse serving Hotel D (archaeological investigations were inconclusive), and has been modeled as a dairy. Structure 5 was a smokehouse serving Pavilion VI.